Vignettes I Heard this Week…. Nicira was acquired. Several hundred people asked me what I thought of the deal and a subset of this group asked me why I did not blog about the deal. I think most people know I work at Plexxi and I think most people know that Nicira and Plexxi share a common investor in Lightspeed Ventures. My first reaction is congratulations to the Nicira team; congratulations to John Vrionis and the LightSpeed team. I read a lot of analysis of the deal and I thought this one was interesting. I always viewed Nicira as a complement to what we are doing at Plexxi, but outside of their material on their web page and what I glean from common customers and industry colleagues, I have never seen a Nicira customer presentation. I would enjoy reviewing one, but the web seems to be void of materials. That might seem puzzling as we share an investor, but typically portfolio managers do cross pollinate information between investors. If anyone can point me to presentation, please let me know. SDN Stuff: Serendipity does occur. Four weeks ago I recorded a podcast with the Packet Pushers team on whether SDN is a game changer. I was asked to participate independent of my affiliation with Plexxi. Here is a link to the podcast on the Packet Pushers site. Ethan and Greg look like geniuses because we recorded this podcast on July 1. Four weeks later in light of the Nicira acquisition there are $1.2B reasons to think that SDN might be disruptive, Finally, a thank you from me to the Packet Pushers team for their gracious invite. I am off for a week in SJC/SFO with numerous customer presentations and Plexxi system trials. In the course of this coming week I know I will be seeing a number of readers and customers in the SDN ecosystem. As of Sunday, I still have a few breakfast, coffee and beer slots open; email or DM if you want to meet. Back in May I wrote this post on the deficient state of venture capital funding for large scale networking projects. At the time, I was not thinking about green tech and companies like Solyndra. I was focused on the network, how it is changing and networking technologies – not social networking or web marketing firms like Groupon; my prior GRPN comments are in this post. At time I was writing my thoughts on how the network is changing, what I was not thinking about was how Arista Networks is affecting the ecosystem inSilicon Valley. If you are looking for an analysis of Arista Networks, this is not it. I am thinking about Arista, but this is not intended as a technology or solution overview; maybe I will do that for another day. Nuova was started in mid-2005. It was self funded by the Cisco executives who left to form the company. This list included: Mario Mazzola, Luca Cafiero, Prem Jain, Soni Jiandani as well as outsiders Ed Bugnion and Tom Lyon. In August 2006, Cisco increased their ownership to 80%. In April 2007, Nuova had ~200 employees and Cisco agreed to a cap of the potential buyout of remaining 20% at $678M. A year later, April 2008 Cisco closed the deal to acquire the remaining 20% for $678M. No venture capital firms were involved to my knowledge. Jayshree Ullalleft Cisco in May 2008. Back to the list of Cisco acquisitions from the 1990s; Granite Systems was founded by Andy Bechtolsheim and David Cheriton. In 2008, Andy Bechtolsheim became Chairman and CDO at Arista networks, which he had founded a few years earlier with David Cheriton. Jayshree became CEO in October 2008. 1. Cisco is having their best switching quarter in their history with revenues closing at $3.54B ending the fiscal year at $10.4B. 2. Sequoia (original Cisco VC) is telling their portfolio companies to cut burn rates, conserve cash, reduce expectations and go into the bunker. 3. Arista namesJayshree UllalCEO. They are just a few months away from their first sale, focused on low latency, high performance compute clusters against Infiniband. 4. Juniper is a few months into the development phase for QFabric. Did I mention that like Nuova, Arista does not have any venture capital firms as investors? At least to my knowledge there are no VC investors. My prediction is we will look back on October 2008 as a pivotal month in the history of networking. The few venture capitalists focused on networking dug in for a long winter’s nap. Their thesis was why be invested in a market in which Cisco is the dominant company? It is also a market that requires a high level of capital to be successful and is perceived to be a mature market – all of which describes a poor set of conditions for entrepreneurial companies. It is much easier to invest in mobile apps and web properties, than fight incumbents that have scale and capital advantages. A small group found that the darkest of times was not the time to sleep. It was the time to plot a revolution and start a new company. While the powerful were distracted – others saw opportunity. That is what was happening in October 2008. As I have written in the past, we are on the verge of significant shift in the structure of the network. It is not clear who the winners will be. The manner in which Arista is affecting the venture capital community is in the terms of lost opportunity. Arista is aggressively marketing the company to the investment community and I suspect they will have large and successful IPO in 2012 – an IPO in which no VCs will participate and no LPs will receive shares. I have seen only one other early stage startup in the datacenter space. There are two others that I know of marketing an A round, but the game is afoot and the clock is ticking. This is not some Openflow appliance game; I am referring to a big league game for real estate in the datacenter – the skyscrapers of the future. If this was 1992 or 1998 there would be 6-10 players in the space – but it is 2011 and it is hard to find players for the big game. End of the Era of Large Scale Venture Backed Innovation? The years 1964 and 1965 mark important milestones in the history of computing and telephony. In 1964 AT&T opened the first central office in the United States. This was the beginning of the migration from operators and five digit dialing, to a nation-wide deployment of circuit switching technology and ten digit dialing. In 1965, IBM introduced the S/360 mainframe computer. When I think of the big bang moment for the telecom, computer and internet industries I think it started in 1964-65. We have gone through 45 years of distributing the power of the mainframe and the CO into the network and users. Now we are at a very interesting point in the network and I think it would foolish to assume that the distribution of computing and networking power will recede. I think it will accelerate. 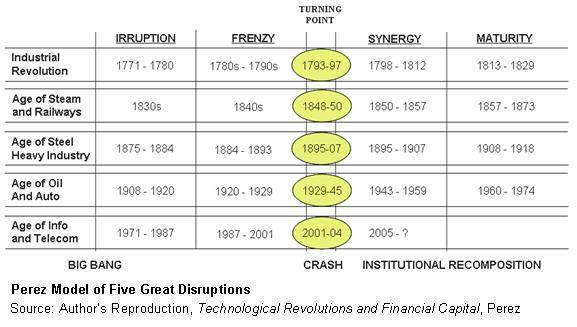 The hypothesis I am exploring is: we are at the inflection point in the network that was dreamed about and theorized about ten, twenty years ago and now that we have arrived, is the market only accessible to public companies capable of large scale R&D efforts? 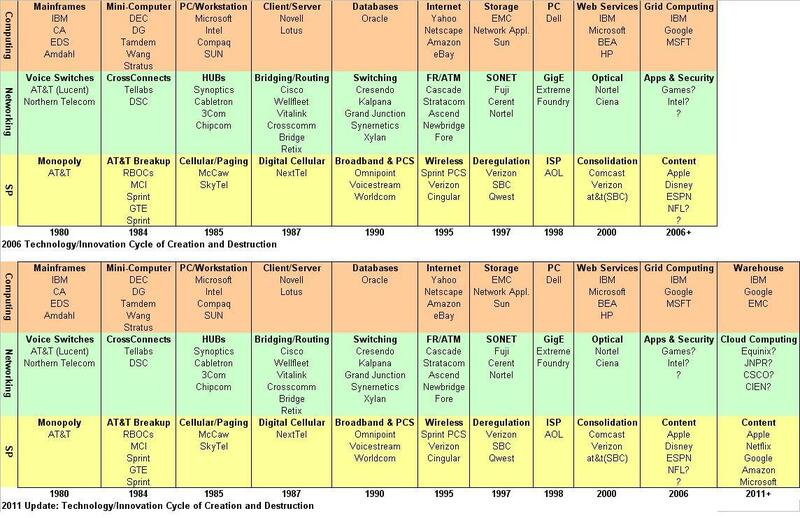 I have spoken to many a VC who thinks that innovation rarely occurs in large companies, yet I would offer up as counter argument that it is true that large companies become trapped by their legacy products, but it was large companies that gave us the MAC, Razr, iPod, iPhone, iPad, DQPSK, Pentium, InkJet…we could write a very long list. I looked at some of the data from the National Venture Capital Association as well as a model I created of annual revenues for 18 companies. I chose these companies at random and maybe if I was sitting at a Factset terminal I could produce a broader, more complete model, but I was just looking for a mix of large cap to small cap, networking, storage, telecom and enterprise focused companies. The companies in the model are: CSCO, JNPR, Alcatel, LU, NT, BAY, CIEN, BRCD, ERIC, NTAP, INFN, APKT, EMC, ARUN, TLAB, FFIV, RVBD and ADTN. I left out HPQ, DELL, AAPL and many more companies. My selection was random as this is a blog – not a market study. Chart 1 below shows the combined revenue of these companies from 1995-2010. It also shows the investment in the networking and equipment sector on an annual basis from the NCVA. I also marked what I termed as the Lost Decade for VCs from an earlier post. If you did not read that post I describe the period from 2001 to 2010 as a lost decade because many of business plans from 2001 are now valid, one simply needs to erase a zero and make 2001 read 2011. Here is chart 2 in which I added the VC investment in internet specific companies. I understand that the capital intensity of internet investing is far less than hardware companies or real science based investments. I would note that the creation of internet specific companies are drivers of network usage and thus can be considered a growth engine for network infrastructure they are using and the creation of long form content. Here is the third chart and I extrapolated some expected growth rates for the 18 sample companies into 2015. Note that even the global credit crisis in 2008-2009 is a blip. As VCs have been avoiding the networking and equipment market, revenues have been going up and the drivers of the new network are going to cause an explosion in network usage and investment. In 2006 I produced the following chart as part of manuscript I wrote thinking about Perez’s theories. I dug it out and updated the model below. It is reasonably accurate, but a few corrections are in order. I called what became known as cloud computing, grid computing. I had the content model correct, just not the all players. At a recent lunch meeting I had an interesting thought expanded upon by a person who has been in a number of VC backed startups. We were talking about the how the process of creating a horizontal company along the lines of the World is Flat theory enabled companies like Huawei to get where there are today and that there is an accelerating trend towards vertical integration (back to the past) in technology. More in house silicon than you think: JNPR, AAPL, CSCO…the list goes on. Companies want to protect IP and move away from homogenized designs using common components, merchant silicon and they way to do that is either through software or custom silicon. For the networking companies that is where the future lies and even Huawei knows it. I think the opportunities in the new network are massive, but I also think many investors are going to miss it because the capital required to be in the market is still handcuffed from 2000-2001 collapse and the lost decade. The drivers are omnipresent: 100G, LTE, Real time content, Long form (or big data) content, Cloud Computing, Persistent connections and all photonic switched DCs. It appears that VCs are going to leave these markets to public companies.